The Captain's Journal » What Does This Tell You About Police Handgun Tactics? When I first saw one of these things at the range mounted on an LCP it looked to be full of fail then. That was to engage a laser pointer. I like a flash light in the weak hand as you can hold it to the side and if they are shooting at you, they miss. 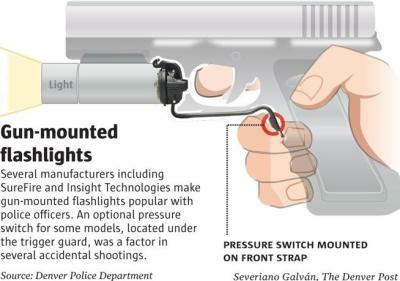 No matter what, if you have a gun mounted light, you are pointing a loaded gun at whatever you’re attempting to illuminate. When police use MRAPS and ever other military “toy” they can get their hands on, this is a symptom of the result. Some of these Rambos have had military training, and may be able to operate these complicated devices (flashlights) without killing someone they didn’t intend to shoot. But isn’t there a rule about not pointing a gun a something you don’t intend to destroy? I’ve used prototype tools that were unsafe. Took precautions, and wasn’t injured, and didn’t hurt anyone around me. IMO, suing Surefire – or whomever the manufacturer happens to be – is simply a diaphanous attempt to deflect blame from poor training, bad tactics, and police militarization. Many “civilian” firearms trainers discourage the use of weapons mounted lights, for a number of reasons, one cited by Paul B. EXCELLENT article. You seem to’ve captured it 10,000%. In my Marine Corps days (67-93), we were taught to keep those booger-hooks VISIBLY OFF the trigger (under penalty of pain) until we were ready to squeeze it and send rounds down range. I agree, NO COP, of any stripe is better trained than a Marine Grunt. None. Anywhere. The growing list of dead and wounded innocent citizens attests to that. By the way, cops calling citizens “civilians” is laughable. These ‘roid-ragers in blue are ALSO CIVILIANS and NOT members of the armed forces of ANY type, let alone my Marine Corps. Though some are prior service, but now acting as CIVIL AUTHORITIES!! And that training never goes away. Maybe a bunch of these wanna be warriors should go through marine boot camp. Like theone I went through years ago, when the DI’s could still beat on the priv’s. Roger that. I went through Parris Island starting January of ’67. That’s funny.. in my 6 month long State trooper stress academy we had 8 military guys in our class. Only 4 graduated (4 either failed out, or quit) and out of the 4 that graduated 2 failed out of the field training program. 22 ‘civilians’ were in our class. 1 failed to graduate and 1 quit the field training program. All the military guys said they thought it’d be easy, but quickly found out it was much harder than their little 8 weeks long boot camp/basic. I won’t try to steal their thunder, but I suspect that the boys above would tell you there is a huge difference between “military guys” and Marines. Probably not MOS 0311. I would bet money not. I think you’re either outright lying or severely embellishing a fanciful story. Which is a sad statement on today’s military. I know the decline in the Marines started about 1975. That was the year they made DI’s stop hitting the priv’s. I hear that now they get “stress cards” so the DI’s can’t even yell at them. Archibald Henderson is spinning in his grave at what the Corps is becoming. Political correctness will destroy this country. Oh, I don’t think so, not quite so much. I think he’s a troll looking for attention. I only humored him. I do think that the current USMC is focused on COIN, expeditionary warfare (which we will never wage again), and staying relevant. And when Daniel left the Corps, he couldn’t train his boots the way he was trained. But 2/6 was going to deploy to Fallujah. It’s funning how deploying to a war brings a certain sobriety and seriousness to the training process. So, dumb idea proves to be dumb. I’ve been saying this ever since I first saw these contraptions. Attaching a light to a gun means the user has just been given a tool designed to be used in a certain manner. Pointing a gun, that happens to have a light on it, at unidentified objects in order to identify them strikes me as a Very Bad Idea with predictable consequences. It violates Gun Safety Rules #2 (always be sure of where the gun is pointing) and #4 (never point a firearm at something unless you are willing to destroy it right now). Attaching a flashlight to a weapon is not a dumb idea. Not having a back-up flashlight, for when you don’t need to shoot something, IS. That’s why I use a 3-D mag-lite in my weak hand. Not only does it light up the area safely, I can use it as a baton if the need arises. I’m so old school I don’t even have a handgun with a rail. Maybe I should jump to the 21st Century. I have never seen it published that the trigger guard is hinged for use when wearing gloves, but every time I’m looking at an AR-15 (and reaching for the wallet) I do check to se if the clone has a hinged trigger guard (some don’t), might be useful if I ever get stuck in the Great White North. Just to be clear, I have a gun mounted light on my XDm .45 on the front rail. I turn it on actually with a switch on the light itself (as opposed to a pressure switch), and I would never point my weapon at someone just to illuminate them. Finally, my finger is off the trigger until I intend to shoot. Basic, simple rules. That’s all this comes down to. You are currently reading "Gun-Mounted Flashlights Linked To Accidental Shootings", entry #12320 on The Captain's Journal. This article is filed under the category(s) Firearms,Guns and was published June 8th, 2014 by Herschel Smith.